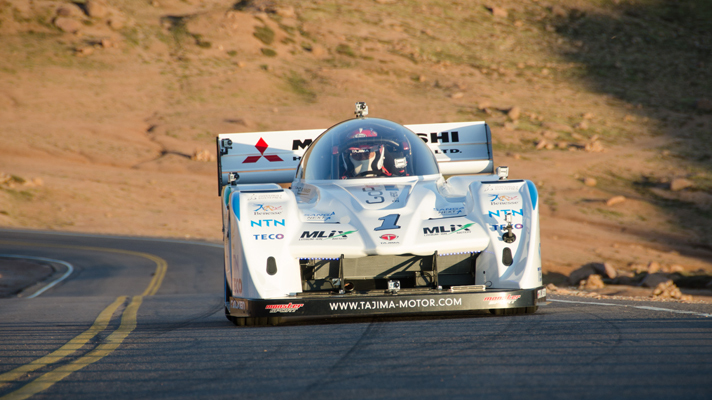 Nine-time Unlimited division champion Nobuhiro “Monster” Tajima has broken the 10 minute barrier with an electric vehicle at Pikes Peak even surpassing the 9:51.278 he turned in during the 2011 race in a 900 hp Suzuki SX4, when he was the first driver ever to crack the Peak’s elusive ten-minute barrier. The new EV record now stands at 9:46.530 beating the 10:15.380 set by Fumio Nutahara for Toyota Motorsport in 2012 and was just a whisker shy of 2012 outright winner Rhys Millen who set 9:46.164 in a 700 hp Hyundai Genesis. The outright hill record goal posts have been moved significantly this year by nine time World Rally Champion Sébastien Loeb setting a time of 8:13.878 in a 900 hp 900 kg Peugeot 208 T16 Pikes Peak Special. 1st. : Nobuhiro Tajima 9:46.530 OVERALL: 5th! 2nd. : Hiroshi Masuoka 10:21.866 OVERALL: 13th! 3rd. : Greg Tracy 10:23.649 OVERALL: 14th! 4th. : Rod Millen 10:24.301 OVERALL: 16th!